Bristol City have signed Austria international striker Stefan Maierhofer on a 28-day emergency loan from Premier League side Wolves. The 27-year-old trades places with Chris Iwelumo, who has returned to Molineux after a month-long loan spell at Ashton Gate. 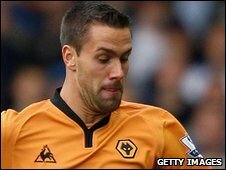 Maierhofer joined Wolves from Rapid Vienna in the summer but has made just two starts. He goes straight into City's squad for Tuesday's trip to Plymouth. Robins boss Gary Johnson told the club website: "We knew signing Stefan was an option available to us if Chris Iwelumo decided to return to Wolves. "He comes highly recommended by Mick McCarthy and is a different type of player to that we already have in the squad."